A knitting needle case. I modified the pattern and made this to fit circular needles, because Sarah needs a circular needle case. Once again, it looks completely crooked and the actual product is totally straight. I think the one side is curling up, causing it to look lopsided. It's not, I promise you! A matching bag to hold balls of yarn and other knitting goods. 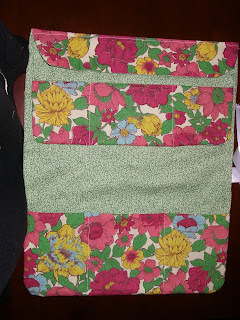 I used fabric from my vintage stash (the flowered print) to make both the case and the bag.